Most of us spend more time indoors over the cooler days of winter. Because of this, the winter season is a good time of the year to complete some interior home upgrades. Here are four winter home improvement projects to work on that will keep you busy this winter season. 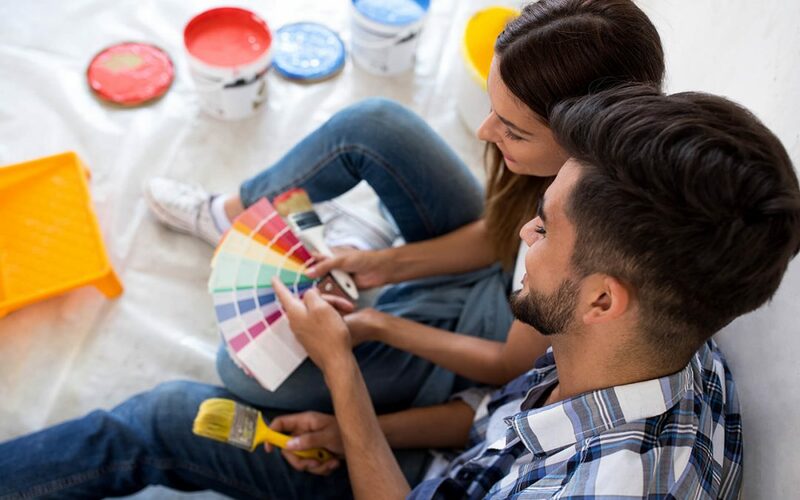 Freshen up your home with some interior repainting. Try adding some bright colors to the family room or bathroom. Winter has colder, drier air, so it is a great time to open the windows slightly to help the paint dry more quickly. You will be surprised how much an accent wall painted a bold color can make a difference in your home. Many people associate the spring as a time of year to get rid of clutter, but why not start in the winter? Start tackling areas in your home with stuff you don’t need, like the garage. Consider donating items to a thrift store or homeless shelter. When the warmer months come, you’ll be able to spend more quality time outside. Decluttering is one of the winter home improvement projects no one wants to do, but you’ll be glad it’s completed by spring. The colder months increase your energy expenses, so insulating doors or windows can help cut some of the costs. Apply weatherstripping to the doors to prevent cold air from entering your home. Replacing weatherstripping and sealing cracks will also benefit you in the summertime when you are trying to keep your cool air inside. Whether your bathroom is becoming a breeding ground for mold and mildew or the tub looks like an advertisement from the 70s, a bathroom upgrade is always a good project in the winter. You can complete a few easier tasks yourself like switching out a faucet, tiling the shower, or replacing laminate flooring. While many winter home improvement projects can be completed on your own, there are some that are better left to the pros. Any project with plumbing, roofing, or electrical may require the help of a professional. Many times, these projects are risky because they could impact your safety or you could make an expensive mistake. When in doubt, it’s best to contact someone for help. Most of these winter home improvement projects can be completed with ease. You’ll feel accomplished knowing you did something that improves the aesthetics and value of your home. 360 Inspections provides home inspection services for the Bay Area and Central Valley in California. Contact us to book an inspection.